John opened Sunrise with his late wife Denise in 2013. John has his own gundogs which he trains and takes out to work but is a lover of dogs of all shapes and sizes. Rebecca began working at Sunrise as a part time summer worker in 2015 and now runs the kennels day to day full time. She also has a part time working Lab/full time spoiled pet! Corrin and Faye both began working at Sunrise part time in 2018. Corrin's family have two small cross breed dogs and Corrin has experience of pet sitting, and has worked hard from a very young age. Faye is currently studying for her Level 3 Extended Diploma in Animal Management and enjoys long walks with her family's Dalmatian and playing women's rugby. Jasmine is the newest recruit and began working on Wednesdays in February 2019. She comes from a gamekeeping and agricultural background and is currently in her second year studying Agriculture at Shuttleworth College. Her family own a Lab, a Spaniel and three terriers. Jasmine has already proven to be hardworking addition to the team and we hope all of our customers will give her a warm welcome. We are licensed by Bedford Borough Council and insured through NFU Mutual. We have 20 kennels, four of which are extra large units for giant breeds, pairs of larger dogs (e.g. two Dobermans or German Shepherds), and groups of dogs from the same family. We are hoping to build four more kennels this year. We are also in the process of having all sleeping area floors coated in a layer of resin, which will reduce the time needed for cleaning and maintenance (meaning more time with the dogs! ), as well as being non-slip and adding a splash of colour. The sleeping compartments are fully insulated and contain a sleeping bench, onto which we place cosy vet bedding, alongside heaters to keep out the chill in winter. Dogs have access to an individual covered outer run during the day. Kennels are alarmed and secured at night and there is an adult on the premises 24/7. Dogs are individually walked on our large field three times a day. For a healthy dog in fair weather, we usually walk for 5 minutes after breakfast to allow dogs to eliminate, as well as 10 minutes midday and 10 minutes before evening feeds for a longer leg-stretch. Walk times are reduced for dogs with relevant health conditions, or in wet or hot weather to prevent chills and dehydration respectively. As well as their walks, dogs have access to a fully covered outer run from 7am to 9pm every day (except in exceptionally cold weather), measuring 3.75m2 in standard units or 7.5m2 in extra large units. All dogs must have a current vaccination certificate to be presented in arrival. Protection against Kennel Cough is also required at least 10 days prior to their stay. Dogs must be protected against fleas and ticks and we keep records of your dog's vaccinations and parasite treatments. We would always try to use your dogs own vet if required, but our own vet is on call 24 hours a day. We do not charge to administer medication and are always happy to meet your dog's health needs. We charge a minimum of 1.5 days for all stays. We charge either a half or full day for drop off and pick up day, depending on drop off and pick up times. We accept payment on collection of the dog by cash, card, cheque or BACS. We sell a small range of CSJ dry feeds by arrangement with kennel customers. 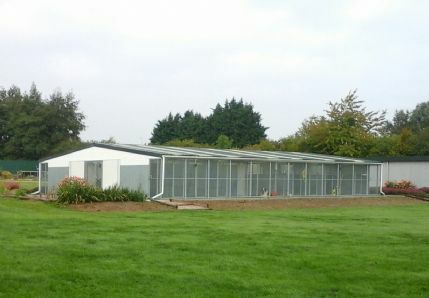 Our kennels, surrounded by green space for your dog's three daily walks. We have plenty of our own space for walking the dogs. Our extra large units allow us to accommodate the bigger breeds that some others can't. Smaller guests are welcome too - cuddles come free! Great boarding kennels, very clean and spacious. My GSD/husky had never stayed in a kennel before so I was worried how he would be. I needn't have worried he had been fine and came home the same old happy boy. Would defiantly use Sunrise again they were extremely helpful and friendly, nothing was too much trouble. Thank you Sunrise. Friendly very clean as the ad says all new,its obvious the owners care about their "guests" and I had no reservations about boarding my dog with them. Sunrise Boarding Kennels is located at 4 Great North Road, Chawston, Bedfordshire on the Southbound carriageway of the A1 on the Bedfordshire/Cambridgeshire border. We receive most of our business from the surrounding towns and villages although we are also a popular choice with those from further afield travelling within the UK, for many of whom our location along the main A1 trunk road is extremely convenient. To reach us, follow the A1 southbound towards the Black Cat Roundabout. The turning for the Great North Road is approximately 500m south of the BP services - there is a sign approximately halfway between the services and the turning. After exiting the A1 follow the road round and continue until you reach the kennels on your right. If the gates are closed please remain in your vehicle and be patient - if you are not allowed in within a minute or two please call 01480 215 900. PLEASE specify drop off and collection times when making your booking. We do board dogs over Christmas and New Year, just with slight alterations to our opening hours.